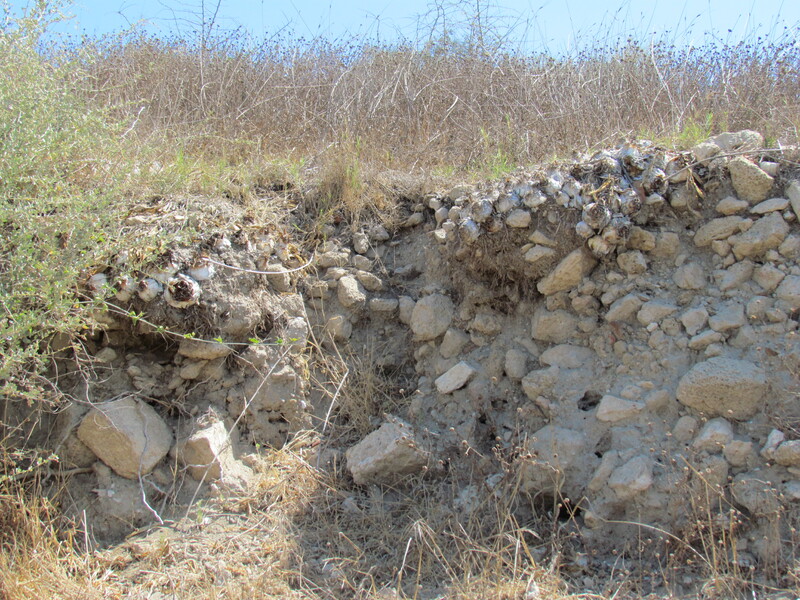 While Ashkelon is noted for many things, such as Philistines, the oldest arched gateway, and horrific Roman-era sewers, it has another, lesser-known claim to fame. It is also the hometown of one of the world’s most popular vegetables: the onion. 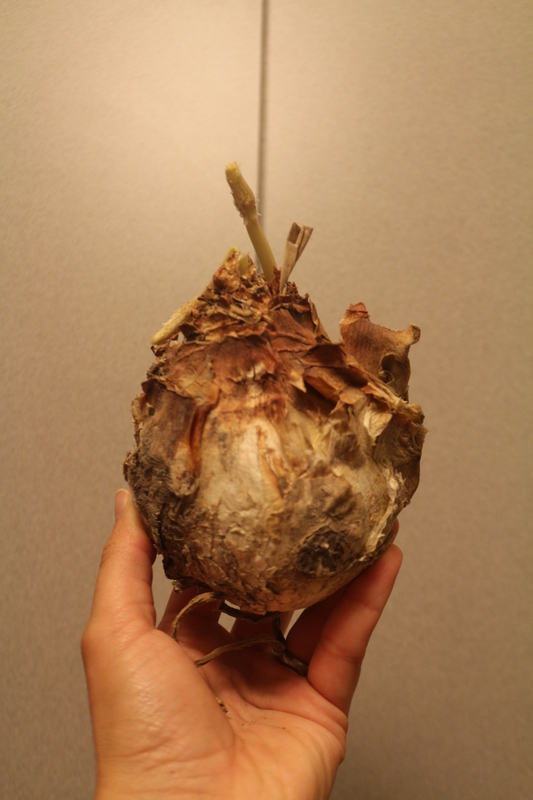 The Ascalonian onion is of a peculiar nature, being barren in some measure in the root; hence it is that the Greeks have recommended it to be reproduced from seed, and not from roots: the transplanting, too, they say, should be done later in the spring, at the time the plant germinates, the result being that it bulbs with all the greater rapidity, and hastens, as it were, to make up for lost time; great dispatch, however, is requisite in taking it up, for when ripe it rots with the greatest rapidity. If propagated from roots, it throws out a long stalk, runs rapidly to seed, and dies. As the name passed through many centuries and many tongues, it was altered slightly into the French shallot and English scallion. Today, scallions are still cultivated in the park, though the crops often suffer from foraging picnicking parties and barbeques. However, in forgotten corners, they have grown quite large, with huge clusters that blossoming archaeologists have to clean out of their grids with pickaxes. It is rather a disappointment to come home smelling like onions without having had the pleasure of eating them. 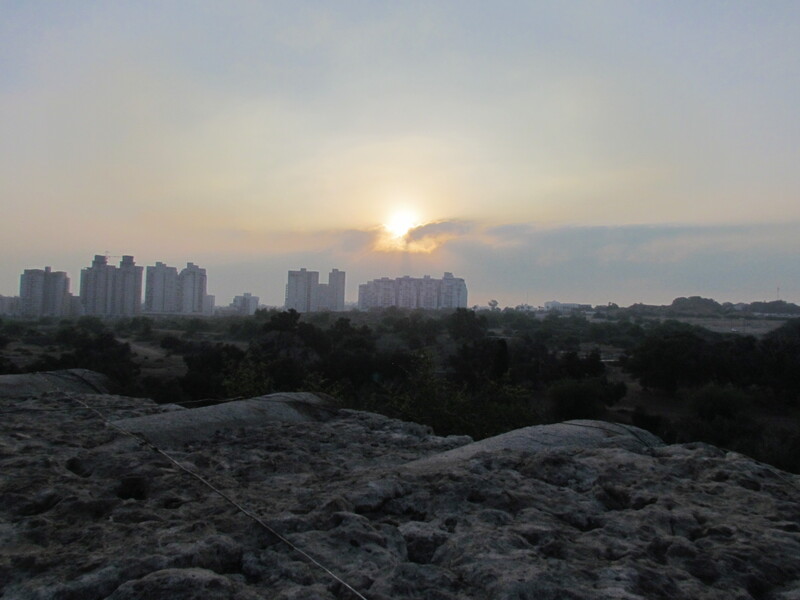 First of all, we would like to thank our readers for their interest in our photo product–we had a wonderful time putting it together during our Vagabonding Tour, and it is now linked in our sidebar if you would like more information. As today marks our 2nd Independence Day in Ashkelon, we would like to describe what life has been like for Rebekah for the past 4 weeks. 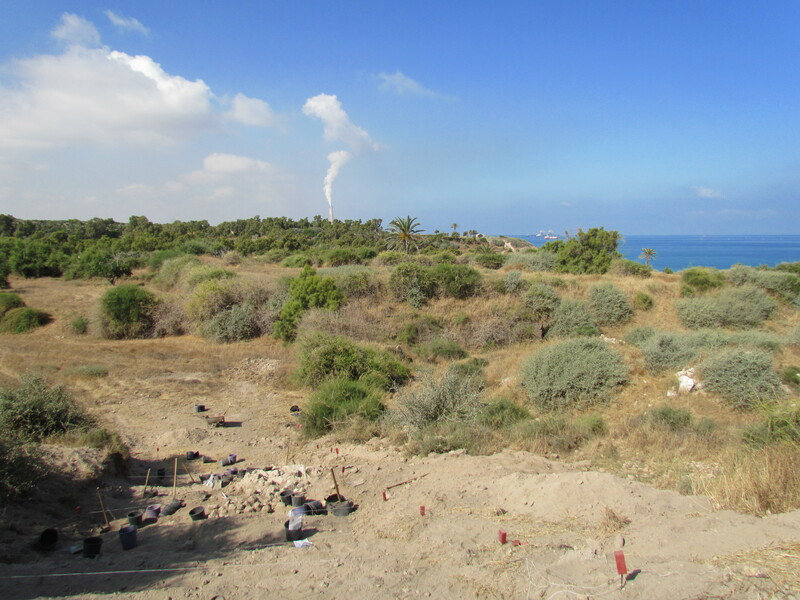 One of the exciting aspects of field archaeology is the various experiences available: occupation levels, the nature of finds, even the methods used can vary depending on where you are digging, and what you are digging for. 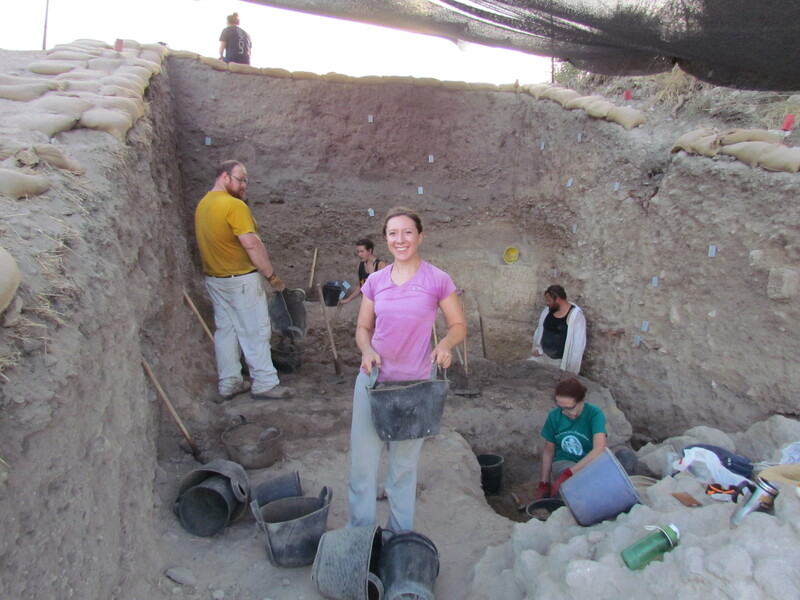 Last season, I had the opportunity to work in Grid 38, where we carefully traced floors and occasionally broke out the delicate tools to flake up layers of phytolith (vestiges of organic materials like baskets or grain) or carefully pedestal beautiful Philistine artifacts. However, this season, I have been in the new Grid 16. 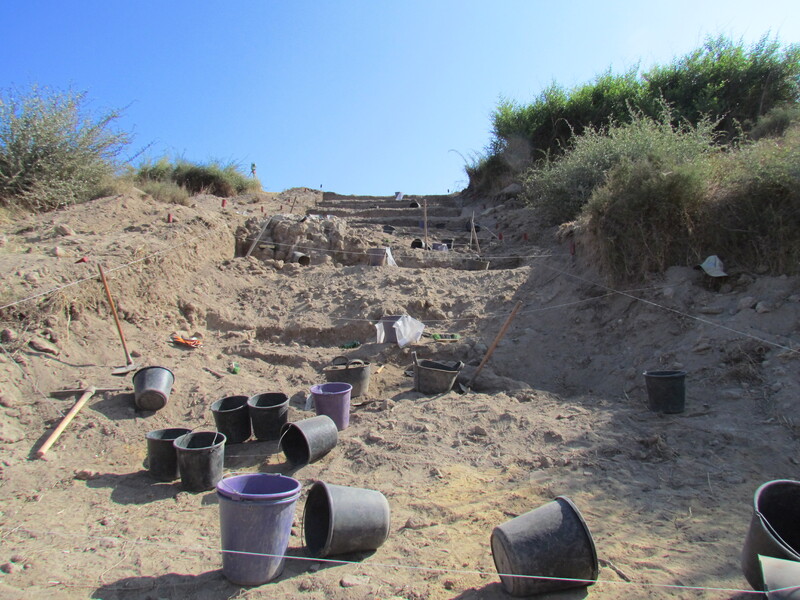 Together with my old supervisor and a new team of volunteers, we have been excavating a step trench in the North Tel of Ashkelon. 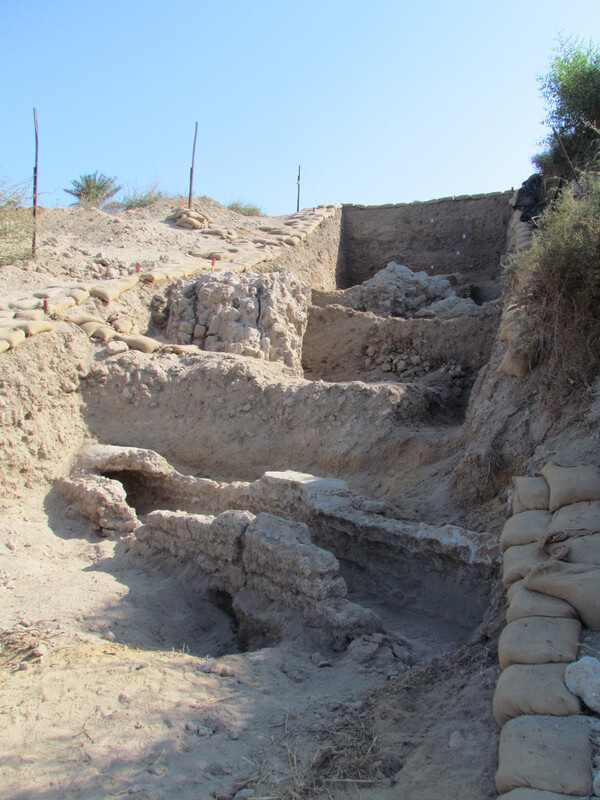 The step trench is an excavation method in which the team digs a trench into a hill or slope of a tel (or rampart) to explore the occupation levels by excavating graduated levels from top to bottom—creating a visual stairway from the latest occupation to the earliest. For us, this was a steep bit on the side of what was at first assumed to be a Crusader-era moat by our friend Richard Cornwall. Our first week was spent transforming what we lovingly termed “The Waterslide,” a flat, slippery grade cleared by heavy equipment, into two squares and 6 steps. 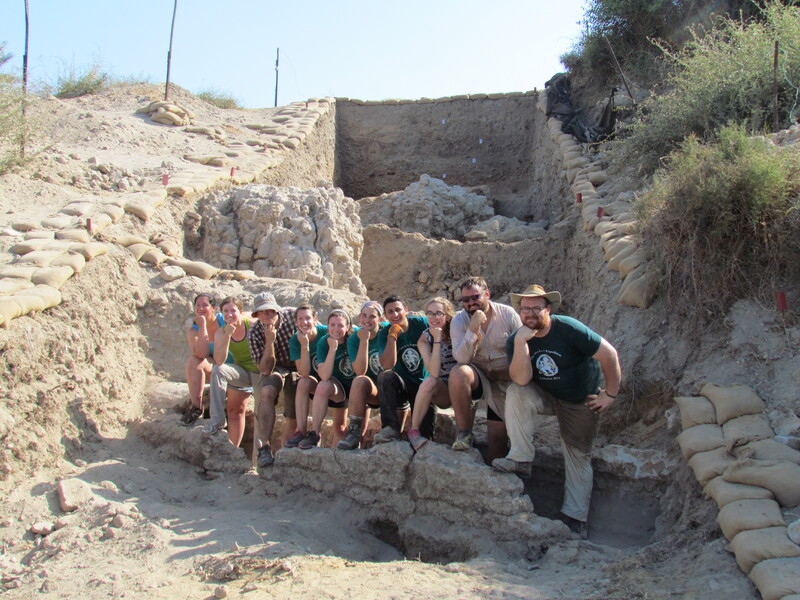 Over the past 4 weeks, those steps have been deconstructed and reconstructed as massive amounts of dirt have been dug and dumped by our team, fluctuating from 8 volunteers to 6, plus our two intrepid supervisors. 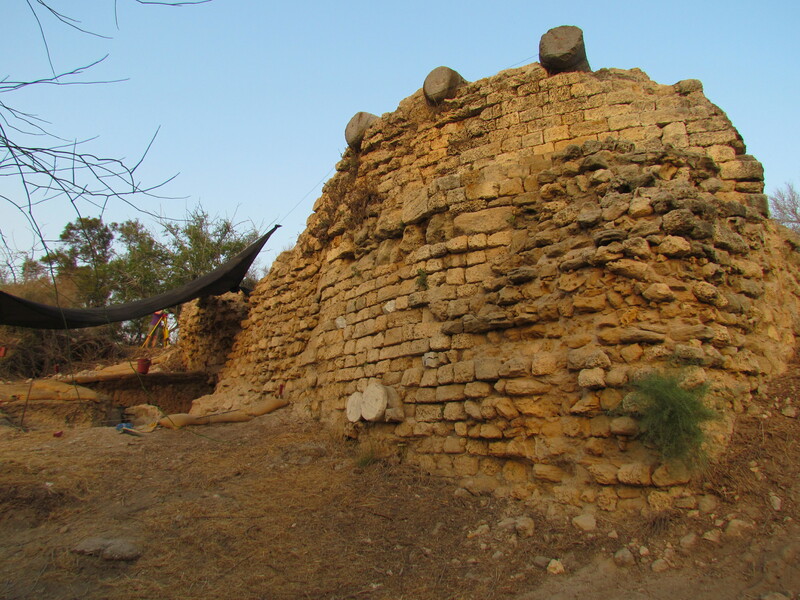 And in those 4 weeks, we have articulated a fantastic tumbled down tower, cleaned out an early-Islamic water channel, sorted through many hundreds of years worth of assorted and intersecting garbage pits, and lovingly cleaned several courses of an Early Bronze Age mudbrick wall. 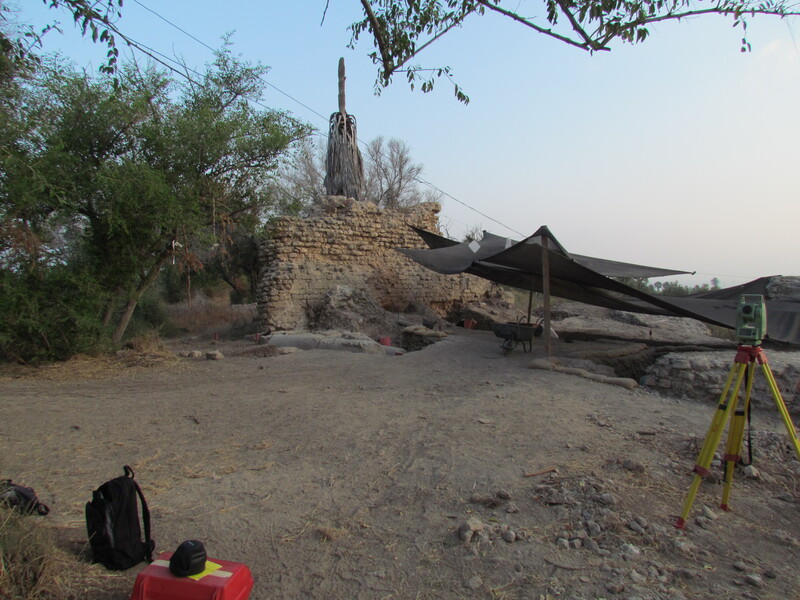 Each day is strenuous, as we use large tools like pickaxes and turias to move dirt into gufas and buckets (which we then haul out). And after the big messes are cleaned up, our task is to brush the loose soil off our area to reveal pit or mortar lines (this is an art—it’s really all in the wrist). But it’s exciting. We’re not treasure hunting, and would have been sorely disappointed so far if we were. 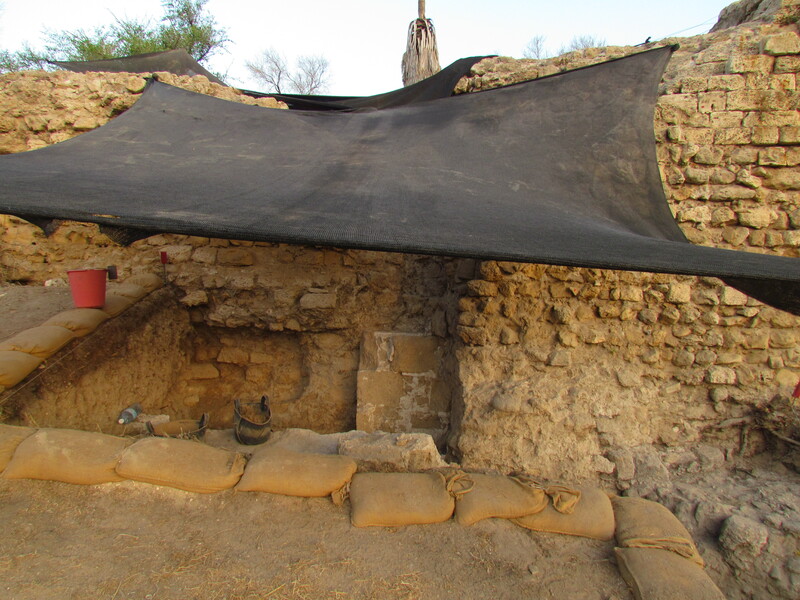 But we’re seeking answers to questions of what parts of the site were inhabited, and by whom and how they lived. The Crusader and Islamic levels have yielded sherds from Cyprus to China and beautifully glazed local pieces. 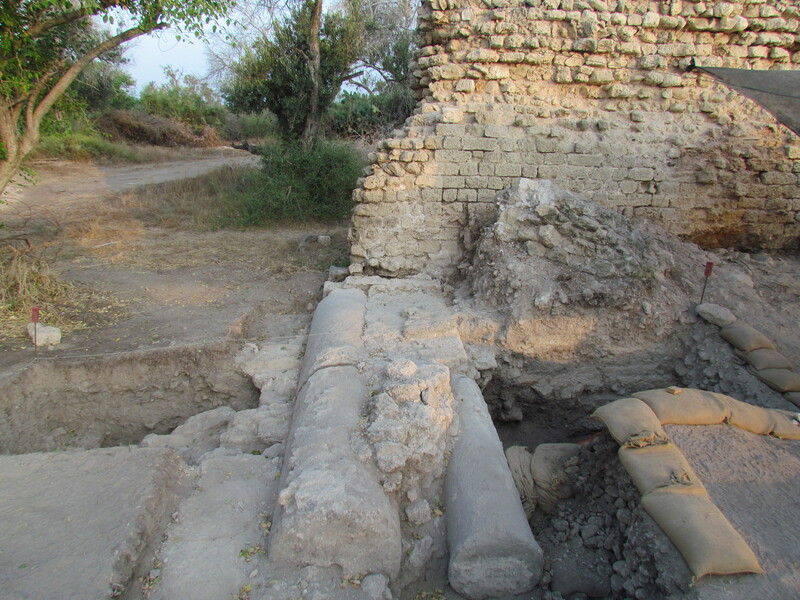 The Byzantine and Roman levels gave us parts of oil lamps and red-glazed ware. Atticware speaks of the Hellenistic age. Most precious of all have been the few ugly sherds of Early Bronze vessels. Through this quest for ancient humanity, you also learn a lot about modern humanity. You live in a land with foreign customs and politics, and learn to navigate and understand them. You also get to watch a rag-tag bunch of near-strangers from all walks of life evolve into a battle-hardened team unified by pride, mutual respect, and the occasional baked goods.